Will Coley moved to Keene from Tennessee this fall with his wife and five of his kids. He hopes to open the city's first mosque in a house on the outskirts of town. 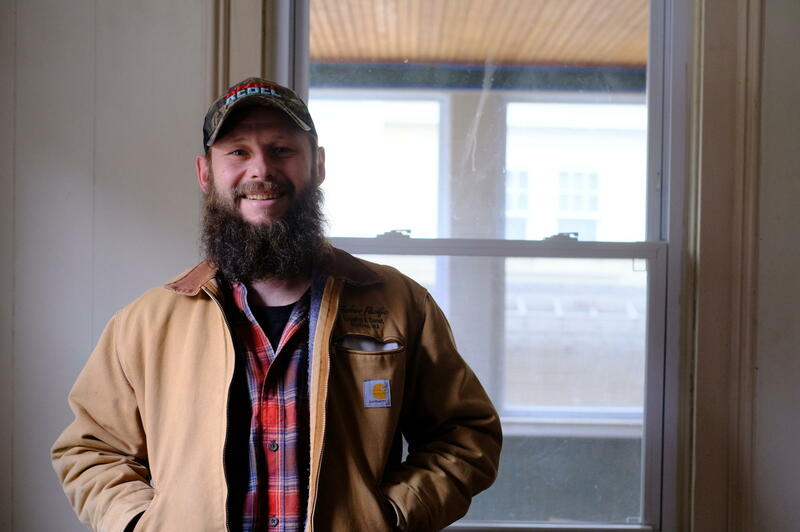 Will Coley walks through the old house in Keene he’s been renovating since September. It’s a work in progress. He steps over rusted metal tiles and points to ceilings and walls awaiting a new coat of paint. He's a Muslim libertarian activist who uses this tagline: America's favorite redneck Muslim. The renovations are taking longer than expected. Among other surprises, Coley arrived to find the house soaked with cat urine. About a dozen cats had been living inside. Coley had only seen pictures of the building before committing to move into it – he hadn’t experienced the smell first-hand. He plans to open a mosque on the first floor, complete with a kitchen to serve food to visitors. The second floor will house bedrooms for him, his wife and their five children. Coley moved to New Hampshire from Tennessee this fall. He’s a Muslim libertarian activist who uses this tagline: America’s favorite redneck Muslim. He’s fairly well known in libertarian circles, and made an unsuccessful bid for the party’s vice-presidential slot last year. Coley ended up in Keene, of all places, because a buddy of his, Ian Freeman, offered to donate the space for the mosque. Freeman’s another libertarian activist and a former member of the Free State Project. Freeman has come into conflict with the city many times over his somewhat theatrical protests and various acts of civil disobedience. He's behind an organization called the Shire Free Church, which the city has rejected for tax-exempt status, and was the target of a 2016 FBI investigation. The Shire Free Church technically owns the building Coley's renovating for the mosque. So, when Coley got word that the city had rejected his application to put up a sign, he went with Freeman to the city offices to figure out what was going on. Freeman brought a video recorder to tape the interaction, a tactic he’s used frequently over the years. Coley said the city hasn’t shown him proof that he needs to submit any documents or go through a review. He thinks city officials are just trying to get back at Freeman for all the trouble Freeman’s caused over the years. But Gary Schneider, who works in Keene’s code enforcement department and appears in the video, said that’s absolutely not the case. “There are a number of places of worship, religious institutions, here in the city of Keene that have gone through these processes with us,” he said. Scheider said he needs to see Coley’s plans so he can make sure the project meets all safety and design codes. These regulatory concerns could delay Coley’s timeline, but he said he has another, bigger concern. He’s worried going through a public approval process could open his religious community up to discrimination or harassment, and he thinks he has good reason to be concerned. That’s because of another Keene resident who has become particularly high profile recently: white nationalist Christopher Cantwell. Cantwell was featured in a viral documentary about the clashes in Charlottesville in August. He’s currently being held in jail in Virginia on a felony charge. He was nicknamed the ‘crying Nazi’ after posting a tearful video about his arrest warrant. To be clear, the city has not said whether it would require Coley to have a public hearing for the mosque. And, in other ways, Coley hasn’t shied from publicity at all. He’s talked with several news outlets about the project and he hopes to have a large public celebration on the mosque’s opening day. He and Cantwell also share a key friend: Ian Freeman. They all appeared on Freeman's radio show last week, with Cantwell on the phone from jail. “I’m a racist. I’m a white nationalist. And I can’t wait to get back to Keene so we can have the crying Nazi and the redneck Muslim all in the same place,” Cantwell said on the show. The comment was followed by laughter from all sides, including from Coley. Asked why he laughed despite considering Cantwell a threat, Coley said he simply found Cantwell's strategy funny. Cantwell has so far been denied bail in Virginia while he awaits trial. His attorney declined to comment. Freeman, for his part, dismissed the idea that Cantwell would rally opposition to Coley's plans in Keene. But Coley said he’s contacted the US Department of Justice about the city's handling of his case, and plans to hire a private attorney. The justice department declined to comment. Coley plans to hold his first services at the mosque shortly after Thanksgiving, with or without the city’s approval. A still from Vice News "Charlottesville: Race and Terror"
New Hampshire-based white nationalist Christopher Cantwell remains in custody in Virginia, where he's raising money and hosting a podcast from his jail cell.